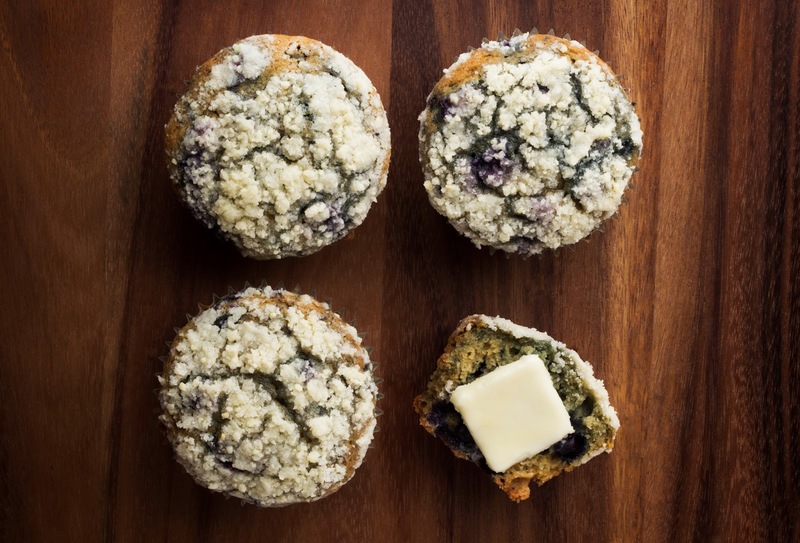 This week, we're all dividing up a few muffin recipes. With so many different flavor variations, it seemed best to divide and conquer. The options to choose from are: corn, bran, blueberry, or lemon poppy seed. Most use similar technique and basic ingredients, so we are all still learning, without having to make so many muffins. All recipes call for a jumbo muffin tin, which makes a big fluffy muffin. This was a bit of a different week for our group (which we'll go into later), so we don't have everyone's input yet, but here's what we have so far. 6 jumbo muffins, standard measure, standard bake 37 minutes. After such great success last week with scones, I was excited to tackle muffins. I chose to make lemon poppy seed muffins, because I happened to have all those ingredients already. The recipe was interesting, it called for mixing the ingredients together with an immersion blender. Well, I don't have one, so I took a chance and used my Vitamix blender instead. The notes said to emulsify the butter, so I figured that would do the trick. And I was right! I mixed all the ingredients in the blender on low and the batter came out smooth and silky. The recipe says to chill the batter overnight, but I was impatient. After 4 hours I baked the muffins in the jumbo muffin tin, spraying the liners first. The smell from the oven was lovely! After the recommended 34 minutes, the muffins were still very pale, so I baked them a few more minutes. It was hard to tell if they were done, they seemed quite wet still, but a cake tester came out clean, so I let them cool. After cooling a few minutes, they firmed up a bit and I was able to see the edges were golden. Tearing into the muffin, it was so fine and crumbly, such an amazing texture. The cake flour gives it that fine crumb. It was light and fluffy, with a strong lemon flavor. Overall, an excellent muffin, and really easy to make. I wonder if the overnight chilling makes such a big difference. I could make the batter one night and bake it in the morning if we had overnight guests, easy like that! I was excited to do this recipe so I could bake the muffins in the panettone molds. I love the presentation. Frozen blueberries are used in this recipe which is genius. When it came time to incorporate them into the batter, they didn't break from my mixing or bleed. As far as baking, I mis-read the panettone mold size as being smaller than mine so I just used the same amount of batter and my muffins exploded over and dripped down the side. Thankfully I was doing a test and only made two. So for anyone using the molds, the book says 125 g for 2.75" molds. I have 2.5" and 90-95g of batter works the best. Part of the preparation in this recipe is to chill the batter overnight so it can hydrate. I waited about 6 hours and they were fluffy and moist. Molasses is used in the batter and when I tasted a muffin when still warm I thought it was a little too strong, added a bit too much spice than I am used to for a blueberry muffin. Otherwise, the recipe is great. The love the height and perfectly even domes that the muffins get. The one nice thing about the molasses is it gives a nice caramel color throughout the muffin. I think I will try it again and let the ingredients rest a bit longer in the refrigerator. I have made these muffins jumbo-sized several times, so I decided to try the standard size. Also, I did bring the batter to room temperature before mixing in the frozen wild blueberries. 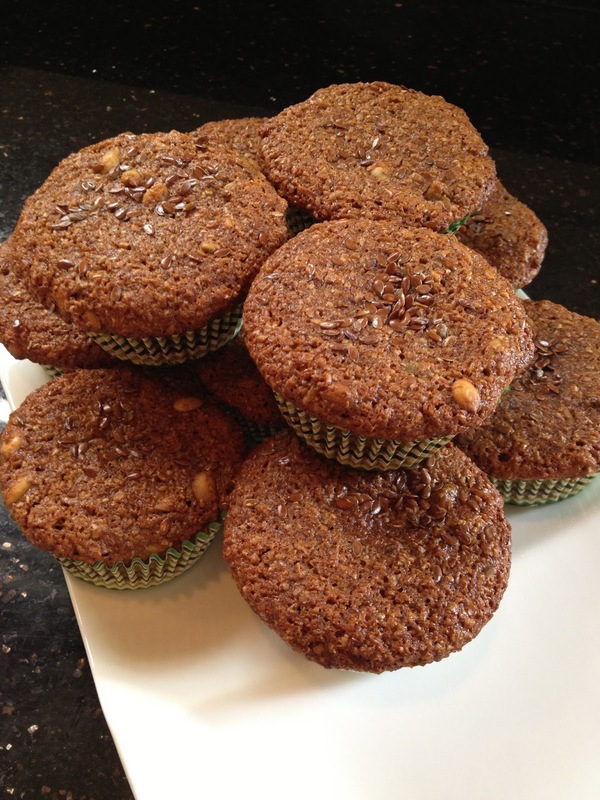 Typically I’m not a fan of molasses, but I have to admit I love the depth of flavor it gives these muffins. And once again, the almond streusel topping pulls it all together perfectly. In past bakes, I knew my oven needed to be calibrated because the I always had to cut the baking time cut short. I found my oven was running 100˚ over so I called in the Viking guy to fix the oven; he replaced the thermostat and now my bakes are coming out golden brown as they should be. I love anything lemon and so to date I've made three batches of the Lemon-Poppyseed muffins. I may begin to sound like a broken record, but these are the best I have ever tasted. Combining the wet ingredients with an immersion blender was a new technique. The purpose of using the immersion blender was to mix in the butter and emulsify it into the batter. Now that is brilliant! The lemon juice was also added using the immersion blender. The lemon zest and poppy seeds were folded in. I like that the book has a special note defining the correct method of folding in ingredients. Refrigeration is required overnight. In the morning when preparing to spoon the batter in the pastry bag, I noticed the batter had thickened overnight and not loose as it was when I first mixed it. I spooned the batter in the pastry bag and pipped in the required 135 grams of batter, but only came out with five muffins. I baked them for 22 minutes since my oven hadn't been fixed yet. On my second and third batches I premeasured the dry ingredients at the same time. When I took the batter out of the refrigerator the next morning, the batter was not as stiff as the first round. Again I got five muffins instead of six. 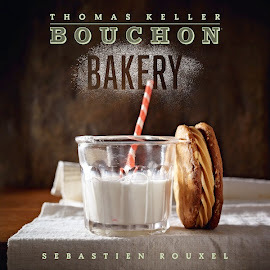 While on our tour at Bouchon Bakery, Matthew McDonald, head baker, advised me to do the math of the ingredients. I decided to make another batch and write the weights down of each and total the complete batch. I came up with 810 grams and divided it by 6 and came up with six muffins at 135 exactly what the books says. Thanks Matthew! I figured out that I didn't use the correct amount of butter on the previous three batches. Now onto the Carrot Muffins! This is one of my favorite recipes in the book so far. The flavor of the pears poached in sauvignon blanc and vanilla bean was excellent. The recipe says you could use canned pears since it is such a small amount but the texture of the poached pears was more firm and I think holds up much better in the finished muffins. The batter was simple to prepare once the bran and germ and pumpkin seeds are toasted and ready. The inclusion of honey certainly help keep them moist even with all that bran, and the molasses added some rich complexity. Next time I would use the golden flax for contrast but I typically only have the dark. The first time I made the muffins I used a standard sized pan and made 12. These were baked in a standard oven and took just a few extra minutes to finish off. When I made another batch, I used a (new) jumbo muffin pan and also convection bake. The second batch was slightly domed thanks to the convection and just a little less sticky on the outside. This was a surprise recipe. I honestly had thought this was going to be a boring cornbread type of muffin. Matter of fact, I had planned only on cutting one in half to see the finished product and not even eating. Wow! I was blown away! Going backwards, I had misunderstood the muffin pan. Jumbo pan, yes I had (The GoldTouch extra large). When I spooned the batter in, the recipe said 1/2 from top. Well, considering I was using the wrong pan, and wrong paper, the muffins turned about cupcake size. They still looked great, and I think are a great size for regular portions. Taste was incredible. This bordered between a cupcake, and cornbread. There was just a hint of sweetness that really highlighted the frozen corn. Also, I had only course grain polenta. I ran it through the food processor thinking that it would grind it a bit finer. I don't think it did. However, because this batter needed to rest overnight, I think it softened the coarser corn flour. It also, I think, added even more corn flavor as well as texture. Muffins did not get 'golden brown'. They did get a golden yellow which is really pretty. The flavor is amazing. 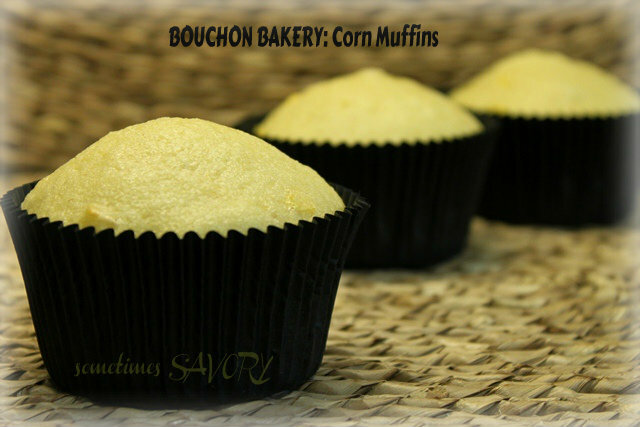 I will make these again and again, looking forward to putting fresh corn in, as well as a few other ingredients. You will like them! I also like having batter ready to go, from the fridge to the oven.